I just thought I had to share these pictures of my cat, Katie, interrupting me during one of my many editing sessions. She felt very sorry for me and felt that I needed a break. Katie also likes to actively help with my writing endeavors by jumping onto the computer desk and running across the keyboard. What can I say? I have one artistic cat. But unfortunately, she also loves the delete button. Luckily for me, Microsoft Word has an undo feature. I love your site and your cute Kitty!!! As I browsed your blog I decided to award you the Creative Blog Award. Deirdra - Thank you very much. 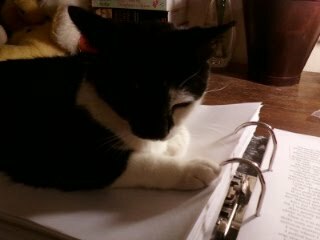 Haha my cat always wants to help me write. 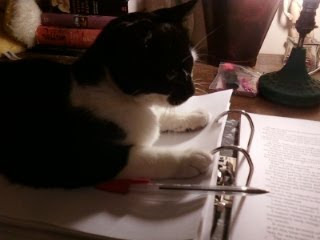 She refuses to understand that literacy is a requirement. Misha - Yep. Cats...I just love em! I love the undo button...and I don't even have a cat! Carla - I completely agree.